The program is an exploration of the early childhood careers from infant care through elementary education. The program is individualized to allow students to prepare for entry level positions upon graduation and/or prepare for further education as a classroom teacher or in a related field.The program involves an on-site laboratory nursery school, as well as an internship within a classroom or child care program that meets the individual needs of each student’s career goal. The scope of the program curriculum allows students to study at a college preparatory level, as well as provide employment skills training. 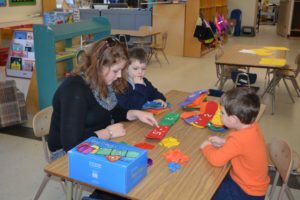 The program offers association with a professional child care organization (NAEYC). Students also receive instruction for infant/child CPR certification. Employment and post-secondary opportunities include: child care programs, community colleges, after school programs, and four-year colleges.